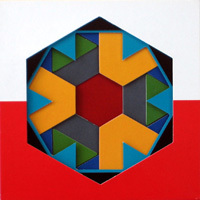 This unique math toy by Marcia Cooke, a math teacher from New Orleans, functions as a puzzle and a tool for visualizing powers of two. The 10-inch square area is cut into colorful wood pieces … one-half, 1/4th, 1/8th, 1/16th, up to one one 128th. These fractions describe the portion of the whole represented by each region. The Powers of Two Puzzle puzzle offers opportunities to explore several important mathematical ideas, including fraction equivalents, fraction multiplication with a common factor of ½, proportional reasoning, area, powers of two, and more. A child does not need to articulate these ideas to benefit from interaction with this puzzle, as current research suggests that exploration of concrete representations can accelerate and deepen understanding of abstract ideas. WARNING: SMALL PARTS. May pose a choking hazard for children under 3 years. Made in Vietnam for children ages 3+. 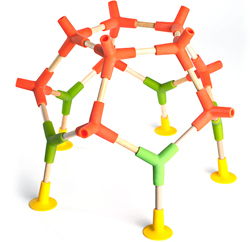 The flexible silicone connectors and wooden sticks allow you to create geometric structures (dodecahedrons, etc.) that bounce, wiggle and move. Contains 10 – 3” sticks, 15 – 5” sticks, 12 – 8” sticks, 6 double connectors, 8 triad connectors, 10 quad connectors, 5 quint connectors, 6 suction cup connectors, and 4 GeoSpheres. Joinks is easy enough for a toddler and complex enough for a chemist. Use the suction cups to secure your structure as you build. Made in China. For ages 3+. The classic design toy from your childhood is back … and improved. Explore circular geometry with the Spriograph from Kahootz (officially licensed by Hasbro) uses putty to hold the gears in place and avoids the need for straight pins (no more holes in your artwork!). 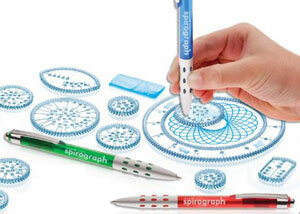 The new Spirograph sets come in two versions; Deluxe Set and the compact Tin box set. Both sets are reasonably priced and provide hours of creative fun. Budding engineers will be captivated by the action of the plastic gears and the infinite geometric patterns will intrigue the mathematically inclined of all ages. There are two styles of Kaleidograph currently available, the crystalline (and aptly named) Crystal and the curved, flower-like Flora set. Both come in a sleeve packaging that doubles as a frame. These deceptively simple sets make great travel toys or coffee table conversation pieces. 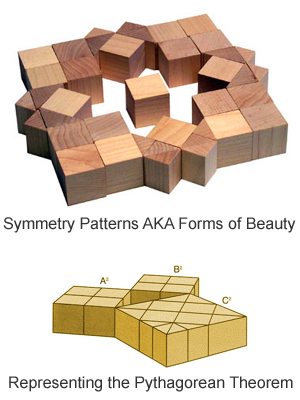 But mostly they are a great way to explore patterns, geometry and symmetry. When Friedrich Froebel created Kindergarten, the first system for educating young children, he also created the first series of educational toys. Froebel used play as the main activity for his school and Spielgabe (play gifts) were the lessons. Gifts 2-6 (“the Building Gifts”) are block sets in various shapes and quantities that are presented as a whole in cube form. Often called Froebel Blocks, they were made famous by Frank Lloyd Wright, and influenced Buckminster Fuller, Albert Einstein and the Bauhaus artists. The blocks allow children to explore pattern, form, symmetry, arthimetic, while developing spatial literacy. Perhaps the world’s most cost-effective educational toys, the Gifts are used by children ages 3 to adult, in home schools, classrooms, or on any table. A simple puzzle and a set of wood building blocks, Fraction Blocks encourage creativity when children build with the shapes and promote problem solving when they return the shapes to the correct location on the board. This educational, fun and durable set is an opportunity for adults to teach proper names for 2-D shapes (circle, square, hexagon, rectangle) as well as the names of the 3-D solids (cylinder, rectangular prism, hexagonal prism, trapezoidal prism, half-cylinder). 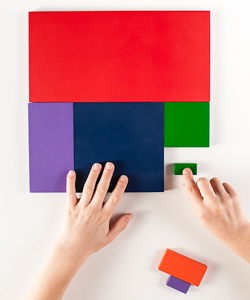 Children will explore fractions and observe a variety of ways these forms can be sectioned. Perhaps the best way to experience the properties of various geometric forms is to hold them in your hands. 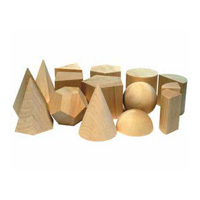 Regular geometric solids made from wood are a great educational materials for the classroom and homeschool learning environment. These sets often contain some of the Platonic solids (cube, tetrahedron, dodecahedron), as well as common solid forms (sphere, cylinder, and triangular prisms) which are used in basic calculations of volume or surface area. 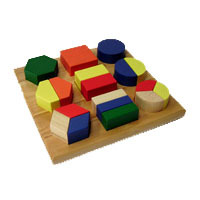 These solids are invaluable tools for observation, comparison, discussion, connecting experiences with abstract mathematics, but also make for fun block play. Skwish is a postmodern take on the classic rattle and winner of numerous awards for its ingeniously simple design. Wooden rods are attached with an elastic string, providing hours of entertainment while developing logical reasoning, fine motor skill, eye-hand coordination, and teaching cause-and-effect. This tensegrity structure was invented by Kenneth Snelson and developed into a toy by Tom Flemons. The term tensegrity was coined by visionary inventor Buckminster Fuller to describe a structure that combines compression and tension to create structural integrity. Possibly the world’s oldest puzzle, developed over 2200 years ago by Greek mathematician Archimedes, this puzzle was not widely known until fairly recently. Consisting of 14 polygons (3-,4-, and 5-sided aka lattice polygons) of varying sizes and shapes that combine to produce a square, this mathematical challenge has over 500 solutions at last count. The original concept of this puzzle lies in the problem of dissecting the area of a square into forms with whole number ratios. 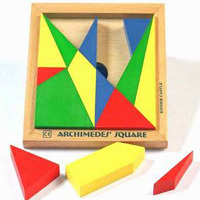 But is just as much fun as a not-so-simple puzzle, or perhaps used to create or match 2-D forms as with a Chinese tangram. 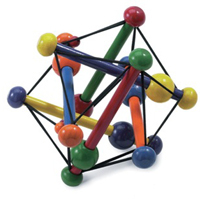 The Zometool construction toy teaches geometry through model building, allowing anyone to create structures (platonic solids, spheres, other shapes) using plastic struts and connecting nodes (zome). 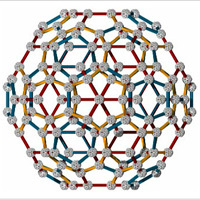 This award-winning toys is used in classrooms and homeschools, but also at NASA and in universities worldwide for modelling chemistry, physics, and mathematical research. The basic sets include the 3,4,5 symmetry struts, but the zome nodes can also accommodate alternate struts, the “green lines” that allow the construction of the regular tetrahedron and octahedron.